The latest scheme by GWP Architecture started on site today. Keepmoat have been appointed to construct the 274 ensuite studio bedroom scheme that are contained within two ‘cluster flat’ blocks and four ‘townhouse’ blocks. It also contains a social hub, gym, quiet work spaces and outdoor fitness trail. 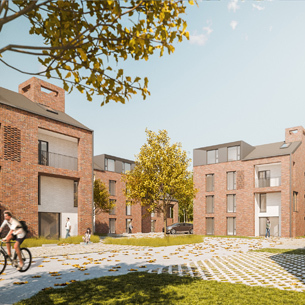 Located on the former Berendsen Laundry site in Neville’s Cross, Durham the £26m project has been developed for County Properties. By design the proposed accommodation will be highly sustainable with significantly reduced consumption of energy and water. This scheme follows in the footsteps of several other student accommodation schemes that have been accredited with a BREEAM ‘outstanding’ rating and this approach will be continued on this scheme. For further information head to the project page.